It’s freezing outside, so cabbage potato soup is pretty much on the regular around here. We escaped the snow deluge that much of the Pacific Northwest experienced yesterday. I was hoping we’d be in the mix. With the new year off to a running start, I’ve spent time planning and setting goals and intentions for the year ahead. I’ve had some struggles in the past few years that I’d like to focus on for improvement. Serious improvement. Not just setting a goal or saying I’m going to do it, sometimes I’m a complete failure at follow-through. But making these new goals a daily intention, which means scheduling time for it… getting specific and staying focused on priorities. Vegetarian cabbage soup helps me maintain those new goals. Not that I eat it to lose weight, rather, I eat it because it’s nourishing, filling, super hearty and it just tastes delicious! The addition of potatoes in this cabbage potato soup gives it that comfort factor I’m after anyway this time of year. 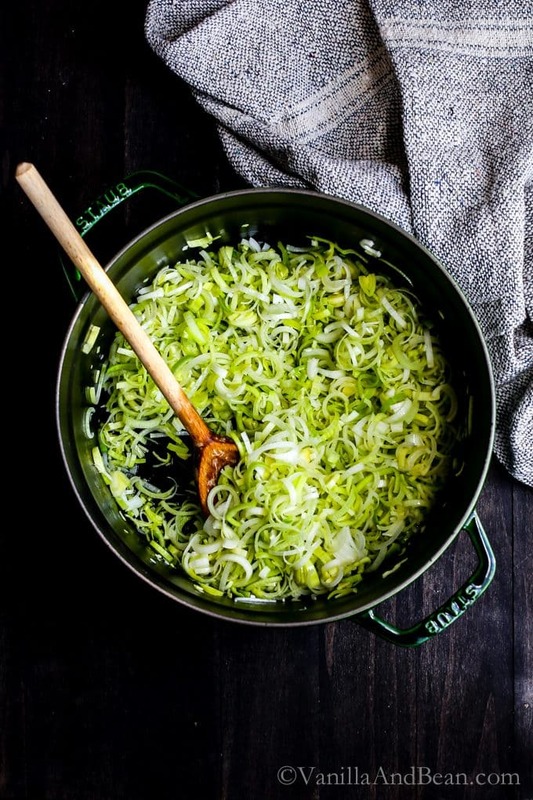 Cabbage potato soup is super simple to pull together too! First, in a large Dutch Oven or stock-pot, add the olive oil (or butter) and heat until shimmering. Add the leeks and cook, stirring frequently. Add the cabbage and stir, cooking down just a bit. Next, add the garlic, 1/2 tsp salt, broth, potatoes and thyme bundle. Bring to a simmer, then cook on low for about 20 minutes for a fork tender potato or 40 minutes to let the potatoes soften further (this time is flexible). Last, remove the thyme bundle and stir in the beans. Warm through, about five minutes. 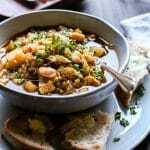 Share vegetarian cabbage soup with crusty bread and a big salad to complete the meal. Butter or Olive Oil: I’ve tried both and prefer the richness butter adds to this soup. Use olive oil for dairy-free. 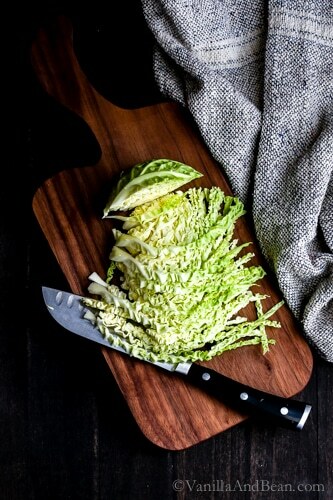 The Cabbage: I’ve used savoy (pictured) and green. While I prefer green, either will work. Green tends to stand up more to the cooking time, producing a more texture-rich soup while the more tender savoy tends to cook down a bit more. The Broth: For a chunkier soup, hold out at least 2 C broth. Go for a high-quality prepared broth, or better yet, homemade. I like Better Than Bouillon. The Potatoes: The longer the soup cooks, the more the potatoes will cook down into the soup. If you prefer fork-tender potatoes, cook them for the shorter amount of time (as seen here.. I was impatient). Longer for a more creamy texture. Is Cabbage Potato Soup Freezer friendly? Yes please! Freeze in individual serving jars, or containers for lunch portions, or in a larger container for family meals. Freeze for up to two weeks. Thaw in the fridge overnight and rewarm on the stovetop on low heat. Hearty, nourishing and simple ingredients. 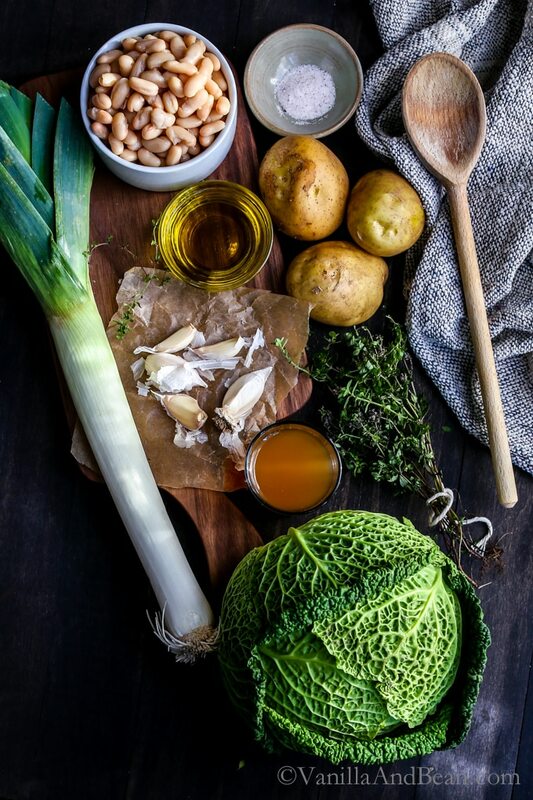 White Bean Cabbage Potato Soup is a steamy one pot recipe that will serve up cozy during the coldest months of the year. 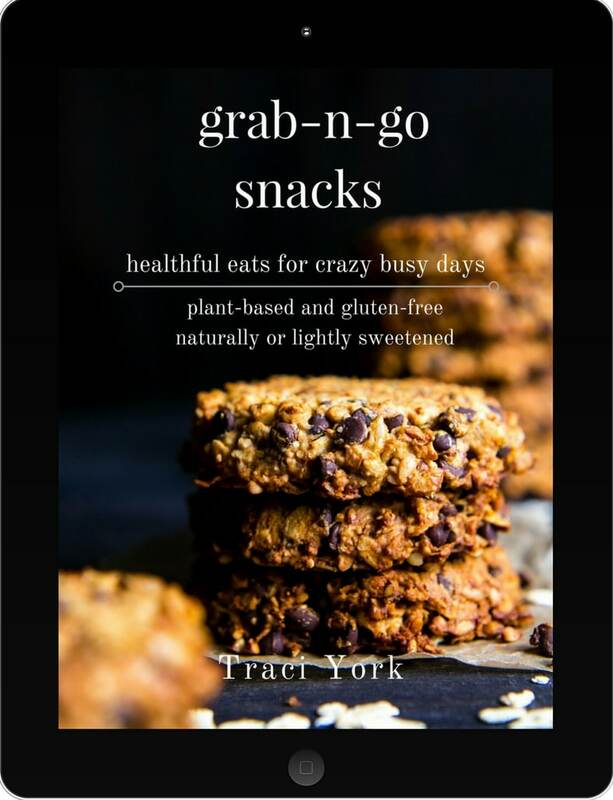 Vegan or Vegetarian, Gluten Free. In a large Dutch Oven or stock-pot, add the olive oil (or butter and melt) and heat until shimmering. Add the leeks and cook, stirring frequently on low until they're soft with a bit of golden color, about 10 minutes. Watch them close, as they can burn easily. Add the cabbage to the leeks. Cook on low stirring occassionally to cook down, about 9-10 minutes (the pot will be very full!). Remove the thyme bundle and stir in the beans. Warm through, about five minutes. Taste to adjust salt and pepper seasoning as needed. Garnish with parmesan and fresh thyme leaves if desired. Store in a lidded container in the refrigerator for up to three days. This soup is freezer friendly. Freeze in individual containers for lunch portion servings or a larger family size container. Thaw overnight in the fridge and gently rewarm on the stovetop. *Olive Oil or Butter: I prefer butter because it adds an added richness to this soup, but if dairy free, olive oil is delicious as well. 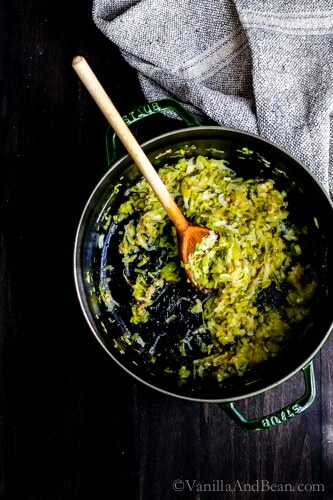 **Green or Savoy Cabbage (savory pictured): I like both equally, but the green cabbage is not quite as soft as the savoy and adds a bit more texture with the given cook times. ***For a chunkier soup, reduce the broth by 2 C and add more to your taste. Hi Lisa! Thank you for your note… I love your internal dialogue, can I borrow it? I reread this post yesterday as I was preparing dinner and I absolutely couldn’t believe I wrote it in 2017! TWO years ago, Lisa! Sigh…. I hope you enjoy the soup :D GO MINI MUFFIN! Just made this today and it was delicious! My family loved it. What I liked was the simple ingredients and that by making more and more soups it doesn’t feel complicated anymore. I was always intimidated by making broth. Health is everything, no? I am so sorry that you have been going through this for a long time. But I am glad you are working with professionals to get help. Okay so headspace.. It has been on my to-do list for a very long time. I need to try it. Reading that you like it, I am more inclined to giving it a try. Thank you for that. Finally, my goal this year is to start my day with journaling. Have you ever heard of the book called The Artist’s Way? The author of that book calls it the morning pages. I used to write my pages every day while we were in the Caribbean, but after we moved up to the States I stopped doing it. I want to go back to being a regular writer. If you haven’t heard of the book and looking for a good read, I highly recommend giving it a read. 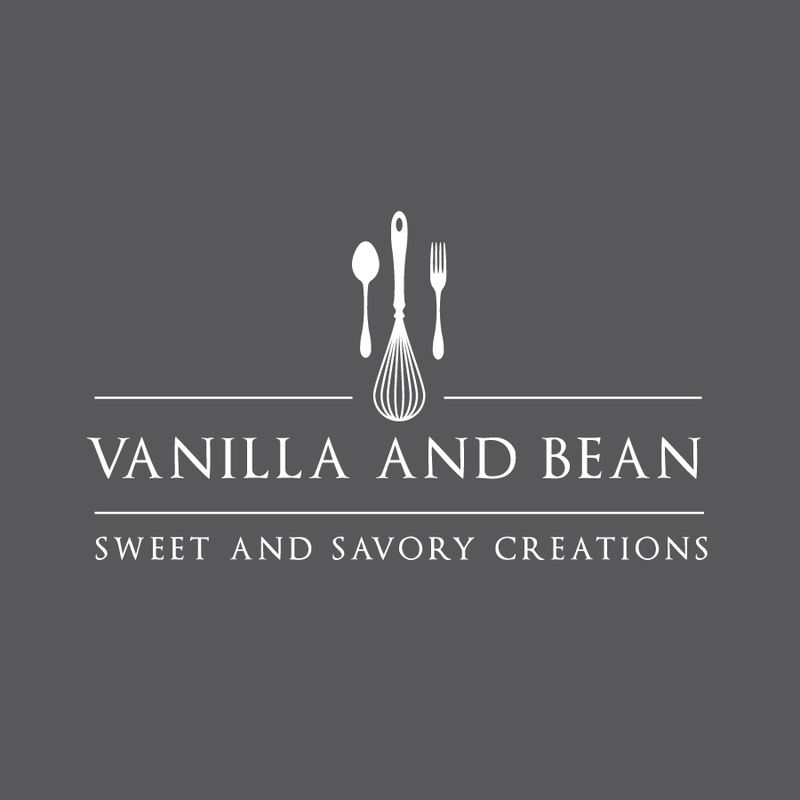 Love, Love your Recipes! Made many of your tasty recipes and everyone loves them..
A friend of mine made this soup and I loved it! I’m trying to lose some weight and was wondering if you had the nutritional facts for this recipe? Thanks! Hi Angie! Thank you for your note. I do not have the USDA nutritional facts for this recipe. Health + mindfulness is a big goal of mine this year too – I’ve been practicing meditation as well, and trying to force myself to do it even when I feel like I don’t have time to sit still for 10 or 20 minutes. Practicing yoga also helps with mindfulness – It’s a work in progress! I feel your pain about the goings-on in our world, but that quote sums it up perfectly. If we stopped to consider everything bad in the world, the sad truth is that happiness would never come. Better to focus on the positive, wonderful things that are going on around us instead…like devouring a big bowl of this soup! It looks fantastic, and so warm and comforting. I’m definitely wanting to slurp up a big bowl! I’m sorry you didn’t get the big dump of snow! Freezing temperatures aren’t as enjoyable when there isn’t snow to go with it! I hear you on trying to keep with your goals and stay healthy! As it turns out, baby weight doesn’t just melt off and I’ve been struggling trying to get into the mind frame to do something about that! I could probably benefit from eating more hearty soups like this one! It looks amazing and so comforting, Traci! I hope everything keeps getting better for you! I saw this recipe and knew I had to make it. So many of my favorite things! It tastes great, is easy to make, and all were pleased with this and a baguette. Thank you, and Bravo. Hey Greg! So happy you enjoyed the recipe with said baguette – a perfect dipping vessel ;) (!!) Thank you for your note! It sounds like you and are in the same boat Traci! I used to be able to eat anything I wanted, any time of day and I wouldn’t have any issues keeping the weight off! Not so much so now that I’m getting older! Stupid old age! And as you know, the life of a food blogger doesn’t help…at all. I have decided to take more time for myself this year. More time out walking and at the gym and way less carbs (my fave)!! And way more water every day (not my fave unfortunately)! This looks like the perfect healthy, hearty soup. 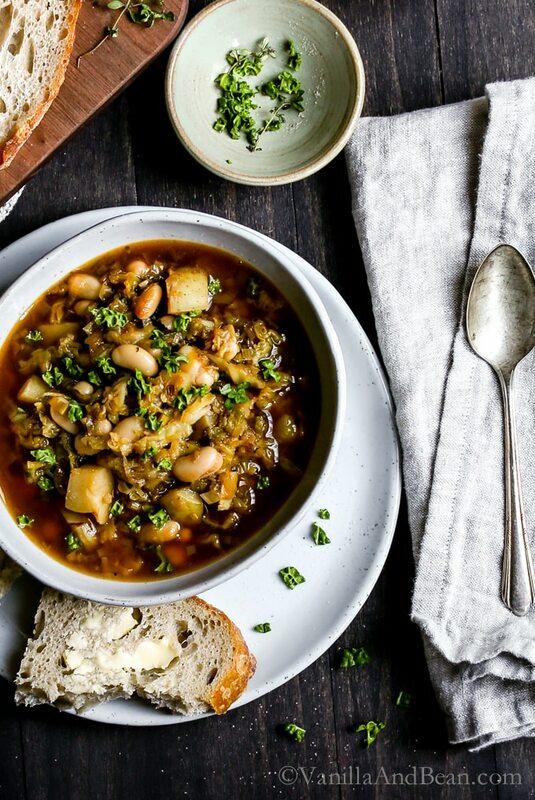 I love white beans and cabbage and haven’t made myself a pot of bean soup in quite a while. I love how easy this recipe looks too! Good luck with your goals for the year! Hope we both do well! Yeah, right on, Meredith! Cabbage is economical as are beans and potatoes. 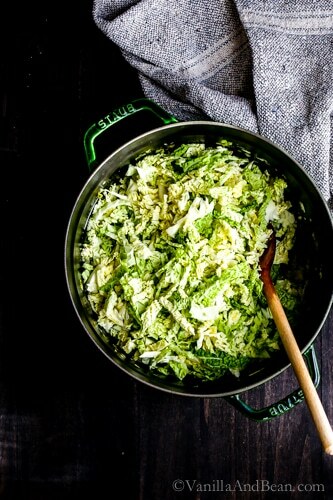 I dare say that cabbage is comfort food… a big pot of steaming cabbage soothes the soul. I hope you enjoy it my dear. I’m eager to give this soup a try. So simple with ingredients that are available to anyone and not too many of them. I like uncomplicated food. It’s easier to taste five ingredients than twenty. You might consider adding yoga to your life. There’s a detox yoga DVD by Maya Fiennes that’s wonderful and doesn’t contain a lot of getting up and down to do. I’m going to be 7o this year. I have to say that I am so looking forward to the changes coming. Usually people my age hate change, but I’ve learned that they happen regardless, why fight a losing battle. Besides, our country needs a good shaking up. It’s been stagnant for far too long. Besides, nothing remains the same. At 70, I’ve lived through 3 marriages -good and bad- and a great many other things. You lose your looks, you lose your friends, you lose your family, but you gain a plethora of wisdom. Wisdom is very calming, as is aging. I am embracing it and looking forward to all it brings, with lots of soup! What is an alternative for the potatoes? Hi Hannah. I’m sorry I don’t have a suggestion for an alternative for the potatoes. You can leave them out if you wish. Just reduce the cooking time. Your soup will be ready in no time! 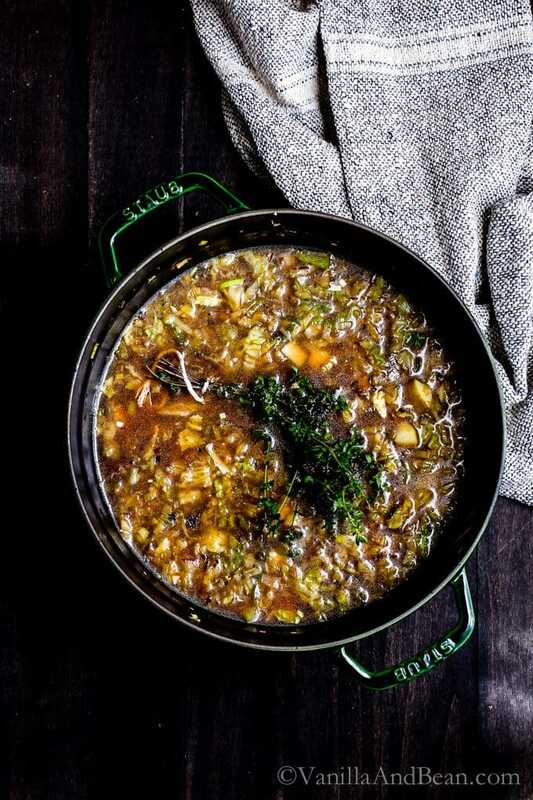 I love your idea of being mindful while cooking soup and making it a calming experience! Too often I’m rushing around in the kitchen and not paying attention to the process. 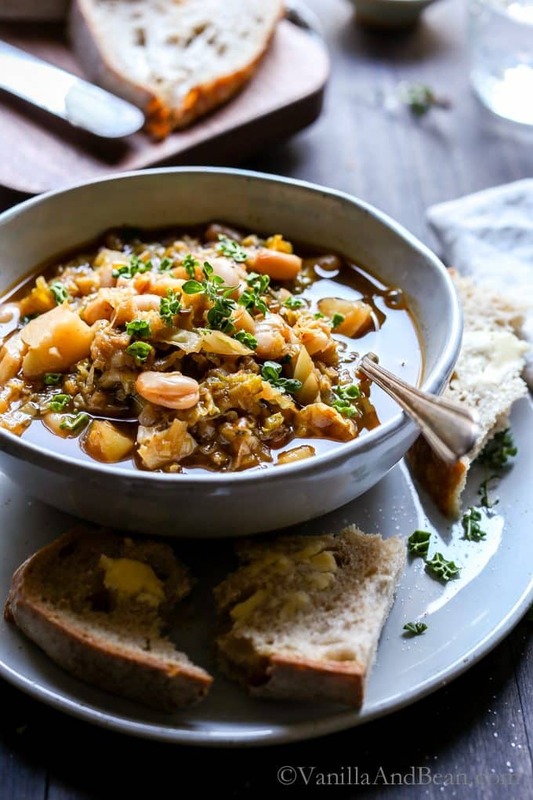 This soup looks so good for a cold day, perfect for pairing with a slice of warm homemade bread- yum!